Each and every year more and more recent graduates are released into the job market with hopes of starting their careers off right. They grab internships left and right to get their foot in the door, and those with the right ambition will work extremely hard to succeed. With such a sluggish job market (and an unemployment rate of 12.7 percent for 20 to 24-year-olds as of August) the competitive drive of job seekers has increased greatly. As a hiring manager or employer, this means you will have a plethora of applications to skim through, but it’s likely you will have a plethora of talent to choose from as well. Recent graduates and young workers are a great source of talent to tap into and they can bring a lot to the table for a company. They are willing to put in the hard work and are ready to apply what they learned in the classroom to real life. Since recent graduates and young job seekers don’t have as much working experience as older job seekers, the interview process may go slightly different than usual. That shouldn’t be a problem though. Most college graduates have already invested time in an internship and can draw examples from that experience. They also have a wealth of experience from navigating around the classroom and having dozens of different bosses (professors) the past few years. Asking the right kind of interview questions will get you the right kind of answers. So what kind of interview questions can you ask recent graduates to test their motivation, integrity, and passion for the industry? Of course, passion in your job isn’t always necessary, but you’ll find that a lot of recent graduates are extremely passionate about what they studied. The following questions may not be staple interview questions, but they will certainly help you gain insight into your recent graduate job seekers. Describe how you managed your time in a class where you had multiple projects at once or where deadlines were frequent. Recent graduates may not have the most experience in managing time in the office, but they have certainly picked up time-management skills from their coursework. That is, of course, if they were successful college students. Asking interview questions like this forces your candidate to address their time-management skills and gives you insight into how they handled multiple deadlines in the past. Tell me about a time you did work that was below average and work that was above average. What were the differences? No matter what they tell you, nearly every student has had a project or assignment that they skimped on. By the same token, every employee can say the same thing about a project or assignment at work. We are only human and can’t always give 110 percent. Good job seekers will answer honestly and will compare and contrast the different situations. Their answer might give you insight into how much integrity they have- which is important information you will want to gather from your job seekers. In your coursework, you probably had to work in a group more than once. Tell me about a time you disagreed with a group member and how you worked it out. Being able to work with fellow coworkers is a quality you want in job seekers and obviously your employees. Interview questions such as this target past conflicts between a team member and force the candidate to tell you how they solved the issue. Conflicts are bound to arise in the workplace and you want to be sure you have employees that know how to deal with them and solve them. Tell me about a time you clashed with a professor’s teaching style and how you worked around it. There will always be a time when employees clash with employers. They will not always see eye to eye. Experienced job seekers, even job seekers that have only had one job, will certainly have an example of when they clashed with a boss. Recent graduates may not have a working situation to hark back to, but they probably didn’t get along swimmingly with each of their professors. Ask them this interview question and gain a better understanding of how they dealt with a power struggle or a disagreement with a higher-up. Tell me about a time you assumed a leadership role and how it worked out. It’s always great to have employees that are born leaders- or even ones that taught themselves leadership qualities. Even in the classroom, leaders flourish. Ask your candidate about how they showed their leadership skills before and see if they have the qualities you need in an employee. As you can see, most of these questions fall under the ‘behavioral interview‘ category and really test how candidates handled situations in the past. This works perfectly even for recent graduates. Tap into the young talent that is out there in the job market and use these interview questions to find the top candidates. 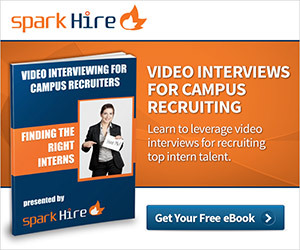 What kind of interview tactics do you use when you interview recent graduates? Share with us in the comments section below!